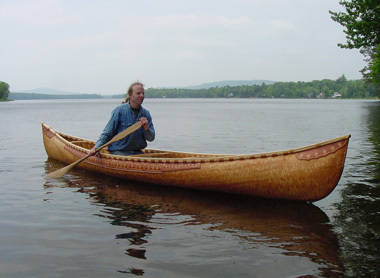 I am building birchbark canoes in the traditional style of the Penobscot, Passamaquoddy, and Maliseet builders of Maine and New Brunswick from the early- to mid-1800's. My information has been garnered from research on old canoes in museums, old photos, and written accounts. My building experience has given me an understanding of the construction details of the old canoes, which are then incorporated into my canoes. It has been my goal to contribute all that I can to the revival of the traditional canoe style of this area, in which there have been few if any birchbark canoe builders since the 1920’s, that is, until recently. The acceptance of my canoes as traditional by present-day tribal members is the ultimate compliment to my efforts. It has been my privilege to complete the circle by offering the results of my research to the people from whose culture these beautiful canoes arose. Example from a photographic study of scale models made by E.T. Adney. The indigenous culture of the Wabanaki homeland evolved through a response of the people to the land; thus it can be said that the culture is as much a reflection of the land as it is of the people. It is with this belief that I have explored the traditional ways of Maine’s native people, as a way of developing a better understanding of Maine’s native forest. The birchbark canoe is a direct outgrowth of that forest, with the materials used in its construction being so perfectly suited for canoe building that it would seem the Creator designed them with that purpose in mind. 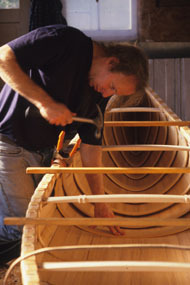 Steve with 16-foot canoe in 2005, photo by David Quist. I have roamed the woods for many years, starting in the hills of West Virginia where I grew up. It was there that my German mother and grandmother taught me to love nature, and there that my Texan father taught me to work with my hands. I first moved to Maine in 1973, where the woods still felt like home, just a little further up the Appalachian chain. 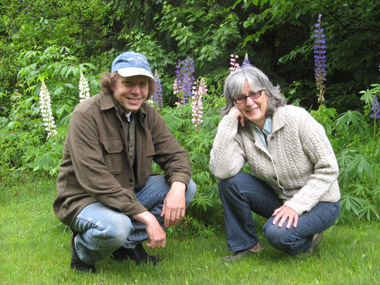 I roamed a while longer, until I met and married fellow West Virginian Angela Derosa, and together we settled on a backwoods homestead in Wellington, Maine in 1987. It is thanks to her strength and tenacity that we have been here ever since. 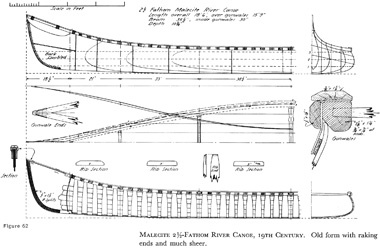 A lines drawing of a Maliseet canoe from The Bark Canoes and Skin Boats of North America by E.T Adney and Howard Chappelle. My interest in birchbark canoes also began at an early age, but it was not until my father gave me a copy of Adney and Chapelle’s "The Bark Canoes and Skin Boats of North America" when I was 16 that it began to get serious. 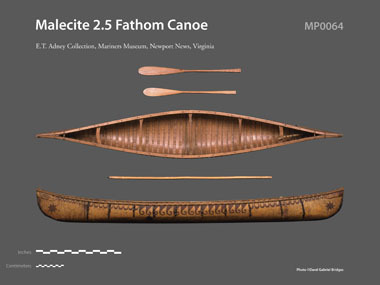 In more recent years I have supplemented Adney’s information with my own research on old Wabanaki canoes in museums, where the spirits of the old builders themselves were my teachers. Steve and David Moses Bridges with one of Steve's canoes in 1999. This was especially true in 1998 when Marian Kaminitz, head of conservation at the National Museum of the American Indian, hired David Moses Bridges, a Passamaquoddy birchbark canoe builder then apprenticing with me, and myself, to help restore a beautiful old birchbark canoe. It was built in the 1890s by Tomah Joseph, a well-known Passamaquoddy birchbark canoe builder of a few generations earlier. As part of this project we had to take a good bit of this canoe apart and carefully put it back together, and in the process we read the canoe’s story, written not in pen but in the strokes of Tomah Joe’s crooked knife. Steve Cayard and Angela DeRosa, June 2010, photo by Lucy Cayard. In 2002, it was through the vision of Penobscot Chief Barry Dana that I was asked to lead a birchbark canoe building workshop on Indian Island, followed by two more, and in 2004 Wayne Brooks asked me to lead one at St. Marys Maliseet First Nation, followed by another there in 2009. Thus The work of Tappan Adney was brought full circle, and the information he recorded was brought back to the people from whom it came. It has been an honor and a privilege to build canoes in the Wabanaki communities, and I am grateful to all who have been involved. Meanwhile I continue to build birchbark canoes in my shop here in Wellington, as I have since 1995. I want to offer a big thank you to Jerry Stelmok of Island Falls Canoe for his encouragement and for his referrals over the years, and for his thoughtful article in WoodenBoat Magazine. And I feel very grateful to my wife and two daughters, for supporting me in pursuing an occupation that brings me so close to the woods, and to the traditions that have been part of this land for time out of mind.